Treat yourself to a mid-year getaway this rainy season at Diamond Hotel Philippines with their Rainy Season Getaway Room Packages. Enjoy a relaxing sojourn in one of the hotel’s Deluxe rooms for only Php 5,500 nett per night which includes buffet breakfast for two persons at Corniche restaurant and complimentary Wi-Fi access. When you check-in for two nights or more, get each night for only Php 5,300 nett. Live in luxury with the Suite Room Package for only Php14,000 nett per night which includes buffet breakfast for two persons at Corniche restaurant, snacks for two adults and two kids via Room Service from 2:00-5:00pm, one-hour massage for two persons per stay, complimentary Wi-Fi access, 20% off on massage and 20% off on laundry. Meals and massage may only be availed during the guest’s stay. Both room packages also include access to the Health Club and Spa, use of the swimming pool, and free scheduled shuttle service to and from Intramuros, SM Mall of Asia and Robinsons Manila Mall on weekends. Rainy Season Getaway room packages is applicable for local residents only and other conditions apply. All promotions are not valid in conjunction with other promotional offers. Prior reservations are encouraged. 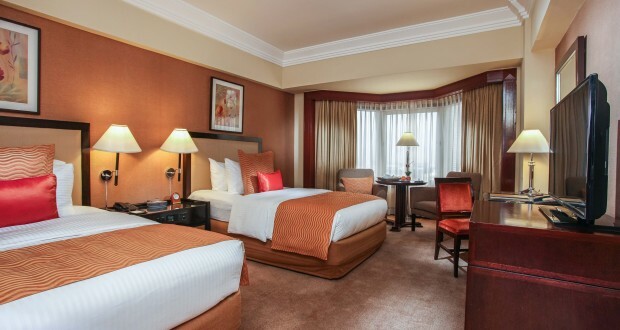 For room or restaurant reservations at Diamond Hotel, please call (632) 528-3000 or email reservations@diamondhotel.com. Diamond Hotel Philippines is located at Roxas Boulevard corner Dr. J. Quintos Street, Manila. For inquiries, please call (632) 528-3000 or email bizcenter@diamondhotel.com. For more information on Diamond Hotel Philippines, please visit www.diamondhotel.com. For hotel updates and special offerings, follow Diamond Hotel Philippines on Facebook, YouTube and Google+, and @DiamondHotelPh on Instagram and Twitter.